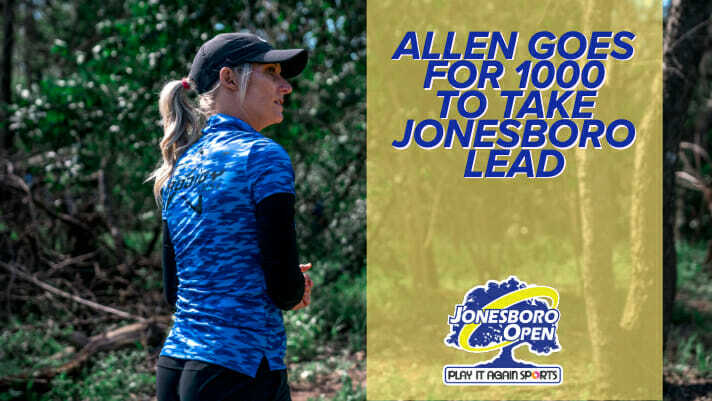 We’re wondering if the Open Women’s lead card at the Jonesboro Open read our round one recap on Friday. After Paige Pierce recorded an opening round 59, we pointed out that she was the only woman to ever record a score in the 50s at the event. On Saturday, Pierce’s three fellow lead card mates matched that feat and shot scores in the 50s in one of the more impressive top-to-bottom rounds of golf we have seen from the division in a long time. And they did it in the rain. Unofficially, Catrina Allen, Henna Blomroos, and Rebecca Cox all shot 1000+ rated rounds, with Allen and Cox recording 1000-rated, 8-under par 58s, and Blomroos carding the hot round 1008-rated, 9-under par 57. Allen is in solo first at 14-under par 118 total. She leads the field in parked percentage at 28%, and only ranks below sixth in one UDisc Live category, Circle 1X putting. Allen was clutch when she needed to be around the green, however, as coming off a hole 12 bogey, her perfect drive on hole 13 caught an edge and rolled into Circle 2. Down a ridge, Allen still converted the birdie from 40 feet to keep pace with the other women. Cox was able to come into the clubhouse bogey-free for the round after securing a 100% scramble rate. She’s doing just fine off the tee, but leads the tournament in C1X and C2 putting at 84% and 44% respectively. Cox only two-putted one hole, and started her day with a 50-foot birdie on hole 1. Cox is tied with Blomroos for second place at 13-under par 119 total. For Blomroos, it’s scary to think what could have been if the putter was working. A 95% fairways, 78% Circle 1 in regulation, and 94% Circle 2 in regulation rate during round two has her leading the tournament in the three categories, but she’s in the bottom half of FPO putting inside the circle. Hole 18 continued to plague Blomroos, as she bogeyed with a three-putt Saturday, and is now 4-over par on the final hole over two rounds. While not in the 50-club, Pierce was solid with a 5-under par 61, but fell to fourth place at 12-under par 120 total. If she wants to contend for the win Sunday, Pierce will need to clean up the putting, having two-putted six times during round two to finish 33% from C1X. Comments on "Catrina Allen In Front After Lead Card Trio Records 1000-Rated Rounds"